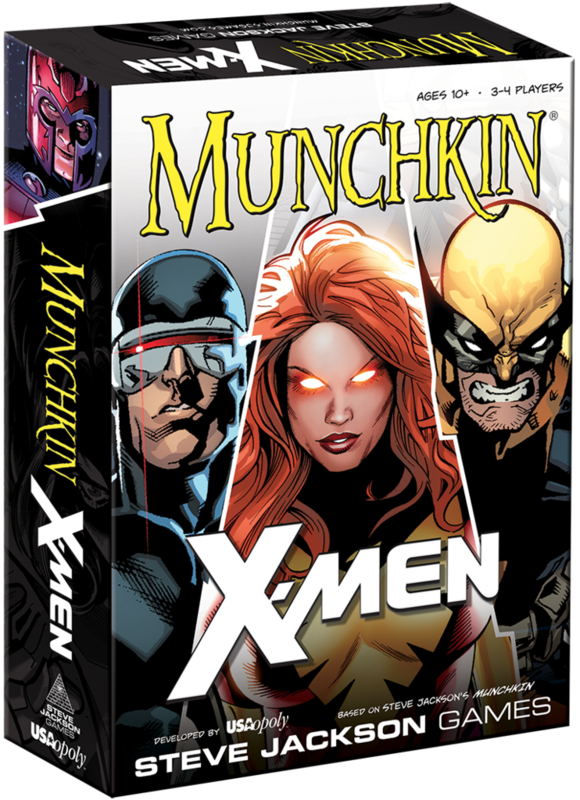 Munchkin X-Men is a game developed and published by USAopoly. It is for 3-4 players. In this game, players take on the role of a student at Xavier’s School for Gifted Youngsters. They will develop their abilities to help them level up as they use their powers to defeat some of the X-men’s most dangerous foes. In the end, the player that reaches level 10 first will be declared the winner and will become the newest member of the X-men. To begin, the cards are divided into two separate decks, one for the Door cards and one for the Treasure cards. Both decks are then shuffled separately. Each player is then dealt 4 cards from each deck. The decks are then placed in the middle of the play area face down. Each player is then dealt a random role card and is given a plastic tracker which is placed on the level 1 rank on their role card. The die is placed where all players can reach it. If a player has any Affiliation or Power cards of Rank 1, they may play them face up in front of themself. If they have usable items or Ally cards, these may be played face up as well. It should be noted that a player is only allowed to have one Affiliation, unless they play a Team Up card. Likewise, they may only have 1 ally. A player may also only equip a certain amount of items. A player is allowed up to 1 headgear, 1 armor, 1 footgear and either 1 two handed item or 2 one handed items. Once players have finished playing any usable cards, play now begins. The game is played over several rounds. Each round, players will take a turn consisting of three phases; kick open the door, look for trouble or loot the room and charity. The first phase is to kick open the door. In this phase, the player will draw the top card from the door deck and turn it face up. If the card revealed is a monster, then combat occurs. We’ll discuss combat in more detail in just a bit. If the player revealed a trap card, then the trap is applied to the player and then discarded, unless the trap has a persistent effect. In this case, it is kept face up in front of the player as a reminder. Any other card types that are revealed are either placed in the player’s hand or may be played immediately if the player is able to legally do so. Let me take a moment now to explain combat. Combat is resolved simply by comparing the monster’s combat strength against the players. The player’s combat strength is a combination of their level along with any bonuses or penalties from special power, affiliations, abilities, items, allies and traps. The player, as well as other players are allowed to play one shot items or use affiliation abilities to either help or harm the player during combat. The monster’s combat strength is a combination of it’s level, as well as any modifiers, plus or minus, from any cards played on it by any player or from it’s own powers. Once these strengths are determined, the player checks each. If the player’s strength is higher, the monster is killed and the player goes up a level, sometimes 2 levels in the case of bigger monsters. The player is also awarded a number of treasure cards, as determined by the monster card defeated. If by some chance, the player is unable to beat the monster because it’s strength is higher, then the player must try to run away. To do this, the player must roll the die. As long as they roll a 5 or higher, they’re fine and suffer no penalties. However, if they roll lower, then they suffer the bad stuff listed on the monster’s card. This could be anything from losing levels, an item or even death. It should be noted that sometimes a monster can not be killed by the player. In these instances it’s ok for the player to ask another player for help. However, only one player may help. If a player does decide to help, their combat strength is added to he current player’s. Of course another player is not obligated to help and so a bit of bribing might be in order to acquire their help. The next phase in a player’s turn is to look for trouble or loot the room. This phase only happens if the player didn’t fight a monster in the last phase. In this phase, the player has 2 options to choose from. If they choose to look for trouble, they may then play a monster card from their hand and fight it. The other option is to loot the room. In this case, the player draws a second card from the door deck face down and places it in their hand. These cards can be saved for later and used on another player’s combat turn or depending on the card that was drawn, they can play it immediately to help themselves. The final phase is the charity phase. In this phase, the player is forced to play or discard down to a hand of only 5 cards. Any excess cards in the player’s hand are then given to the player with the lowest level. Once this has been completed, play passes to the next player in turn order. The game continues until a player is able to beat a monster to become level 10. When that happens, the game is over and the level 10 player is the winner. Let me just say, I’ve been a fan of Marvel comics for a long time, especially the X-Men. I’ve been reading them since I was a kid and still enjoy them. The characters have always been some of my favorites in all the world of comics; characters like Gambit and Rogue, Nightcrawler, Dazzler, Longshot, Magneto, Mister Sinister and even Wolverine. The cards in this game show off characters like them and what makes them who they are in a really beautiful way. The artwork is really amazing. Each deck has lots of stunning visuals that you will simply love looking at. The role cards are bigger and are double sided with a female mutant on one side and a male mutant on the other. I like that each role is different and provides a unique ability that only they have. It’s like you are your own mutant. The die that comes with the game is really nice. It’s very bright and colorful and has an X-Men X on one side. It’s really cool looking and I think it looks really nice. Lastly, there are some small round discs that are red and somewhat see through. These are used to keep track of your level with. Overall, I love the look of everything that comes inside the box, including the insert. Yes, I said I like the insert. It’s a rather cool looking piece too. Everything looks amazing. The rulebook for this one is quite nice. There are plenty of pictures and examples throughout the book. Like many of the Munchkin rulebooks, it does seem a bit longer than it has to be. The rules themselves aren’t that difficult and could easily be explained in a lot less time and with a lot fewer words. However, I’m not complaining. I’d rather have everything covered in detail then have to go hunting for explanations online. Everything is well covered, as I just said. There are some instructions for combining this game with other Munchkin sets like the Munchkin Marvel edition or even Super Munchkin. However, you’ll have to go online or have a copy of the rules from Munchkin 7 – Cheat With Both Hands to be able to merge sets with. There are a few variants that can be used as players see fit as well. Overall, the rules are pretty good. I can’t really complain about them too much. Anyone that’s played Munchkin before knows how much fun and chaotic this type of game can be. The same is true of this one as well. It’s a lot of good old fashioned chaos but fun to the hilt. This version introduces the world of the X-Men to the game. You’ve got these role types that you can play as which are really quite cool. It’s like you’re playing a new mutant in Xavier’s school that’s trying to learn the ropes. Each player has special powers that will help them throughout the game. I really like how this makes each character a bit more unique and makes the game a little more thematic. The biggest change in the game for me was the traps. In Munchkin you face curses, however this game changes them to traps. Thematically it makes more sense but really does the same job. As a fan of Munchkin, I especially like this version. As I mentioned before I’m a big fan of Marvel comics so any fans like me should really enjoy this game. Fans of Munchkin and especially the newest Marvel version should really enjoy this one, especially since it can be combined with the Marvel edition. Overall, we really enjoy it as most comic fans should. I highly recommend it. It’s definitely one that will see a lot of play time with us. 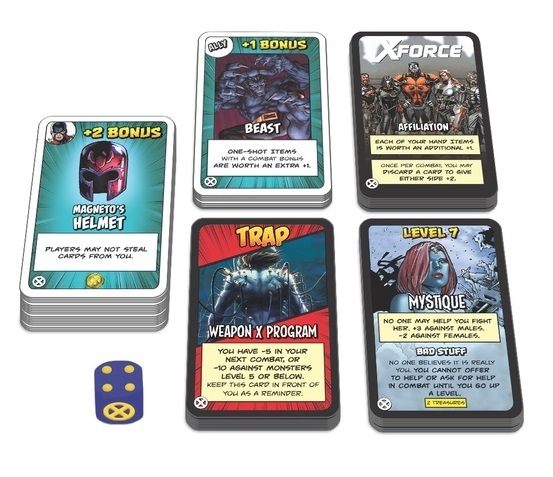 Munchkin X-Men is a light weight card game that brings Marvel’s X-Men to the world of Munchkin. The game is very easy and fun to play. It doesn’t take too long to play. Most game sessions last around an hour. Fans of Marvel comics, especially the X-Men should really enjoy this one. Munchkin fans will enjoy this one too, especially if they’ve already been enjoing the Marvel edition that can easily be combined with this game. The artwork is really great on all the cards. I love how cool each one looks. It’s like the images were ripped right from the comics. The game is tons of fun and is great with teens and kids of all ages, making this a very family friendly game. This is one that I highly recommend. Stan Lee would be very proud. Excelsior! This entry was posted in Reviews and tagged board, board games, card, card games, comics, games, marvel, marvel comics, munchkin, munchkin x-men, munchkin xmen, usaopoly, x-men, xmen. Bookmark the permalink.